Has your resolve has already weakened and have resolutions already been abandoned, or are about to be? Well, take the opportunity of the new lunar year (Chinese New Year) to renew your goal-setting vows. (i) Apply the SMARTER formula to be sure that the goal is well formulated. Wishing you every success with your goals for the coming year, and here are some previous posts to help. So what kind of year have you had? According to my year on Facebook, it’s ‘end of year review’ app makes it look as if all I ever do is eat! Of course it’s based on pictures posted and I’m careful what I share on Facebook just in case it alters its terms and conditions and my photographs end up in some dodgy advertising campaign. Nevertheless, it still feels a bit imbalanced. Seeing my Facebook year in pictures has forced me to consider the questions ‘Did I have the year I wanted?’ ‘What do I want from the coming year and how do I go about getting it? How I answer these question comes down to my values. So how about you? Does your Facebook summary might do justice to the year you’ve had, assuming you’ve succumbed to the lure of Facebook. What are your highlights and how did these coincide with your values? When interviewing students for a place on a psychology course I used to ask ‘What are you going to have to give up to complete this course?’ It’s a great question to ask when pursuing any personal goals. Most people have time in their lives where they just fill that time (or kill time). Usually potential students answered that they would spend less time watching TV. Of course, less time spent on Facebook is another possibility. How do you spend time on there and does it further your goals. If you are running a business then social media can be very useful. However many people use social media to relieve boredom. In order to focus the coming year, consider your top values in life. These will form the headlines for the year ahead. Top of my values list is ‘curiosity or love of learning’. For this to appear in my end of year review, I’m going to have to take actions to learn stuff. Another of my values is ‘making a contribution’. So I have to think about translating that value into action. Matching goals to values is an important part of personal development. Another value is making connections with people as opposed to going through the motions electronically. So I know I have read books, attended courses, run my own courses, coached people and met some new people this year. None of this is reflected in my facebook year, but i have honestly. Check out my Facebook page! The truth is that you don’t have to take photographs of every little event in your life. We can lose out of living in the present moment whilst fiddling about getting the right lighting and camera settings. It’s enough to keep your main values as themes at front of your mind as reminders. These values become the guide for actions. So if you find yourself spending hours in front of the TV or computer screen, you can ask yourself: How is this supporting my values? Is this going to be one of the year’s highlights? Is this going to make up a large proportion of my year? Your values become your checklist throughout the year so that you don’t get to the end of the year wondering where it went and what you did with it. So what if you’re so busy getting on with life that you don’t end up with a great album in Facebook. 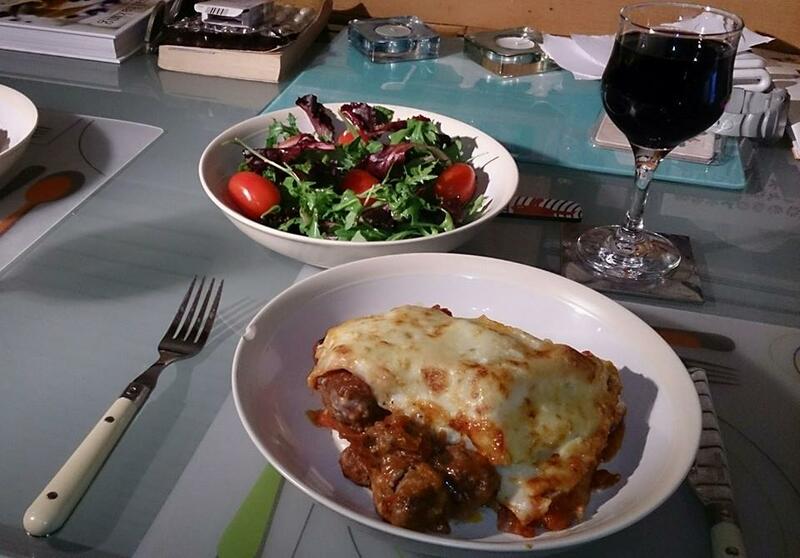 Now here’s a picture of my meatball lasagne! The name Ebenezer Scrooge, the principle character from Charles Dickens’s A Christmas Carol has become synonymous for embittered miserliness and especially for someone who does not embrace the ‘spirit of Christmas’. At the start of his journey he cares nothing for people and is only interested in money. By the end of the story Scrooge was a changed man. He discovered the true meaning of Christmas. His name became synonymous with altruism and generosity. He was Mr Christmas. A Christmas Carol is a story of redemption. It is a tale of values and how to focus on what truly matters in life. It was set in a bleak time of abject poverty and the social injustice of the casualties of the Industrial revolution. The story has resonance with modern-day austerity cuts where the most vulnerable in society have had to pay for the mistakes of the most affluent (. . . steps off soapbox. . .) Back to the main point. Christmas seems to start earlier every year. Cards and decorations appear in the shops around August. It has little or nothing to do with the values that Scrooge rediscovered by the end of the tale. Modern-day Christmas is driven by the values of the pre-enlightened Scrooge. In a perverse twist and turn around, those who decry commercialism are branded ‘Scrooge’ or ‘Ebenezer’ or chided with the statement ‘bah humbug’. It’s true that Christmas is a real hugger-mugger of a festival and means different things to different people. In A Christmas Carol, Dickens did a lot to bring together disparate traditions and associations surrounding the Yuletide season. He helped us to re-embrace the pagan and yet at the heart of the story, there is a universal sense of humanity. So we have a pagan festival, hijacked by the Christian Church, in part, unified by Dickens and now hijacked by commercialism. Christmas is something that can now only be purchased and if you don’t have money then you are excluded. No doubt it will continue to evolve and mutate with more ‘traditions’ added. Hopefully, somewhere in the mix there will be space to re-discover what Scrooge discovered: If it’s not about people then it truly is humbug. Dr Gary Wood is a social psychologist and life coach. He is author of Unlock Your Confidence which is based on his confidence-building workshops. Gary is based in Birmingham and Edinburgh where he runs his own training and coaching practice and research consultancy. He also offers coaching worldwide through Skype. Contact Gary by email to see how his solution focused (life) coaching approach would benefit you or your organization. See: Testimonials from former clients. We all have mental chatter. It’s often a running commentary on our lives, going on inside our heads. Sometimes it’s a dialogue where a couple of voices argue the rights and wrongs of a situation. Often it would be nice if we could switch off those voices that take us out of the present moment. So what can we do? There is a simple but effective way of acknowledging the thoughts without allowing them to carry us away into the future or into the past. The first step is to recognise that although thoughts may weigh us down, they don’t actually have a mass. They aren’t real things. One of the common problems people report when trying to meditate is that they can’t clear their minds and switch off their thoughts. However, what if the thoughts occur for a reason? What if they ‘mean well’? What if all we really have to do is acknowledge them. In psychology despite appearances we aren’t very good at multi-tasking. Our attention is very selective. We can’t process all the information that comes our way, so our attention shifts to the things that have the greatest importance for us or to the things that shout loudest? So what if all of this mental chatter is just a way for our brains to get our attention. It’s often said that when we face death, our lives flash before us. One theory is that our brains indiscriminately download everything we know, in the hope that the solution is there somewhere. A similar thing happens when we are stressed. Our brains chatter away like small children trying to get attention, often repeating the same things, over and over again. The technique for dealing with mental chatter in everyday life is simple. It’s the same as dealing with mental chatter when we are trying to meditate. All we have to do is name the thought. Just acknowledge the thought and say ‘Thought about. . . . ‘. Then bring your attention back to the present moment. It is a choice to engage with the thought. Often naming it is enough. Often when trying to solve a problem, the mind will often keep firing off the same thoughts. If naming the thought doesn’t quieten the mental chatter, simple ask ‘Is there anything new here?’ If there is, make a note of it, if there is not say ‘nothing new, got it covered’ then let it go. This simple practice, quieten the mind, reduce stress and give you a useful list of possible solutions.